Choose your style of rubberwood desktop. From light to dark, we recommend selecting a finish to match your office decor. The Rubberwood Desktop is available in a natural, dark brown, or light brown finish. All three finishes feature a subtle luster with muted wood grain characteristics. The natural finish is the lighter of the three and makes for a soft, eye-pleasing desktop. The light brown finish is a shade darker, while still being a light and refreshing color choice. Dark brown is our most striking color option, and boasts chocolate tones in the wood grains. The UPLIFT Rubberwood Desktop is 30" deep and available in the following widths: 48", 60", 72", or 80" wide. Rubberwood is a very durable lumber, and these 13/16" thick desktops won't warp or break. Your desk should rise to the level of the work you do and the goals you're trying to accomplish. 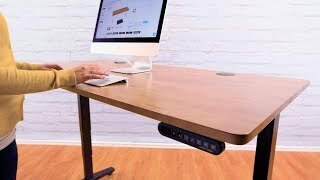 Using the height adjustable frame that Wirecutter named their top choice, the UPLIFT V2 Rubberwood Standing Desk raises the bar on efficiency, stability, and innovation in ergonomic workspaces. Searching for an affordable hardwood desk that not only looks beautiful but also makes the most out of our precious resources? Made from recycled rubber trees, our UPLIFT V2 Rubberwood Standing Desk allows you to get a desk made from real wood, one that's as easy on the planet as it is on your wallet. If you'd like to be able to compare all available desktop materials, check out our UPLIFT V2 Standing Desk which presents all available 2-leg desktop styles. You're getting the most advanced sit-stand desk available with the UPLIFT V2 Frame or the UPLIFT V2 Commercial Frame. Learn more about both the UPLIFT V2 Frame and the UPLIFT V2 Commercial Frame—and to compare the differences between them. Starting off as Hevea brasiliensis trees in Southeast Asia, the lumber used in these desktops is responsibly sourced from retired rubberwood trees. Although its name would suggest it, this wood is not the consistency of rubber. In fact, its lumber is hearty like that of other hardwoods, which we handcraft into these beautiful tops. At 13/16" thick, this desktop is durable enough to stand up to the rigors of daily use and look good while doing it. We seal the surface with one of three different finishes: natural, light brown, and dark brown. We've selected these finishes because they let the lustrous woodgrains in these desktop shine through, giving you a few options of style that matches your office décor perfectly. Finished without harsh chemicals or dangerous dyes, you can breathe easy when you bring the UPLIFT V2 Rubberwood Standing Desk into your space. Rubberwood is also offered on 3-leg and 4-leg desks. If you're interested in other types of desktops, we also offer a growing collection of desktop materials, shapes, and sizes. The UPLIFT V2 Frame is smarter thanks to its advanced safety features, more reliably powerful when adjusting due to a dual motor design, and built with contract-grade quality, giving you a workstation that will suit you today and well into the future. We spent years refining our design until it was just right—and we're proud of the end result: a desk that truly helps you achieve more at work. The UPLIFT V2 Desk comes with a height range of 25.5" - 51.1" (with a 1" desktop installed). Remarkably sturdy, surprisingly quiet, and amazingly advanced, it's really no wonder it was selected as the best standing desk by Wirecutter. The UPLIFT V2 Commercial Desk has a height range of 22.6" - 48.7" (with a 1" desktop installed). This frame features a lower starting height, a lower max height, and a wider overall height-adjustment range than the UPLIFT V2 Frame. In addition to meeting ANSI/BIFMA durability standards, it also meets the ANSI/BIFMA G1-2013 height standard (a standard required by many of the world's largest companies). The UPLIFT V2 Commercial Frame also supports ideal ergonomic working postures for 5th percentile females through 95th percentile males, in both seated and standing positions. The UPLIFT V2 Frame gives you 48 independent, patent-pending mounting points to use. Install CPU holders, attach desk extensions, or even hang an under-desk hammock (for a mid-afternoon nap). All of the holes are built right into the frame, so you can maintain a clean, organized look at your workstation. That's what the UPLIFT V2 Frame is here for: to provide you a sleek design and more advanced features, enabling you to do more with your desk. Use your desk to its fullest potential; as we keep adding to our line of desk accessories, you can keep adding to your workstation until it's just right. Please note: The Under-Desk Hammock is only compatible with the UPLIFT V2 Frame. It's not compatible with the UPLIFT V2 Commercial Frame because it interferes with the stability crossbar. Save time when you change your desk height, and unlock new features on your UPLIFT V2 Rubberwood Standing Desk, with our Advanced Keypad. One-touch adjustments let you store up to four height preferences using its programmable memory buttons. Press a button when you feel like switching postures; this desk adjusts quickly and quietly, giving you enough time to move your chair out of the way. Two new safety features—anti-collision sensitivity and a keypad child lock—make your desk safer. On the off chance that it does bump into objects or people, it's smart enough to know to stop. And if there are little ones running around, prevent a possible accident by locking your desk's height. The desk's maximum and minimum heights can also be set to your liking, to prevent your desktop from knocking into shelves above or file cabinets below. The keypad's auto-dark LED screen helps you stay focused by dimming 10 seconds after use. We've been called the "Best Standing Desk" by both Wirecutter and Forbes. We are also rated #1 by Wired, Lifehacker, and many others. Join the hundreds of thousands of customers who have tried—and loved—UPLIFT Desk, including hundreds of Fortune 500 companies. From everyone here at UPLIFT Desk, we want to tell you, our customers, thank you for your support. We started UPLIFT Desk after listening to you, and it's been our mission, from the very beginning, to assist every person and every office in creating spaces that support every body. We're dedicated to keeping our prices as low as possible, while holding our product quality to the highest standards. Each day, more and more people all over the globe are working better and living healthier. Join them by getting an UPLIFT Desk. Power your desk, your devices, and everything in between with power options from UPLIFT Desk. Want in-desk power? Try our power grommets. Need a safeguard from electrical issues? Our clamp-on surge protector will do just the trick. Our power accessories are helpful additions to your workstation, helping you stay charged and ready for anything. If you see cables and cords hanging precariously under and around your workstation, it's time for some wire management. This common office eyesore can actually cause accidents when you adjust your sit-stand desk, pulling devices and snagging cords. Don't let this be you. We have wire management solutions for every type of setup. Work with confidence that your cords are tucked away and protected, right where they should be. Your desk even comes with a wire management tray, so you can stash a few stray cords at the back of your new desk. design team is here to help you get the ball rolling; let us create a customized office layout just for you. If you're building a space with four or more desks, all you have to do is complete four simple steps, and we'll configure your office for free, no strings attached. You'll even get a discounted quote for your order, to help you turn your office dreams into an affordable reality. Rubberwood is a tropical hardwood that is light blond colored and medium-density, sourced from Hevea brasiliensis (their scientific name) or Pará rubber trees (their more common name). It's also known as plantation hardwood, parawood, Hevea, or Malaysian Oak. It is not made of rubber, but produces the "sap" that is used to create latex that makes up millions of products sold all over the world.